When it comes to smoking lounges in Dallas, you can’t beat the traditional flair of Chamberlain’s. Probably the most well known of the pack, Chamberlain’s draws those looking to pass their time in a bygone era when the idea of a ban on smoking would have simply been met with scoffing. The smoke den is furnished with distressed leather couches, bar stools, and a faux baby grand piano. Dining tables accommodate those who wish to enjoy a 10 ounce ribeye and a fine whiskey with their stogy. An upgraded A/C system with three corner-mounted exhaust vents makes for top of the line filtration. You can choose from 16 available cigars, including several hard-to-find ones such as the Avo Tesoro, or you can bring one from home for a cutting fee. Next on the list is Javier’s cigar room. This gourmet Mexican restaurant in uptown is a see-and-be-seen type of place; its smoke room in particular attracts a socially elite crowd. With a classic Mexican feel throughout, it seems right to be sitting down, smoking a Cuban and sipping on a margarita in front of the fire. Havana Social Club stands out among smoking rooms, because rather than just transport you to another time, it takes you to another place entirely. Located in Victory Park, you feel much more like you are in downtown Havana instead of downtown Dallas. The club offers a great variety of fine cigars such as Arturo Fuente and Zino Davidoff, as well as authentic Cuban sangria, classic rum cocktails, and some of the best mojitos in town. You can also store your cigars in private humidor lockers to keep your stogies in prime condition. For a new twist on an old idea, try Absinthe Lounge inside Southside on Lamar. This smoking room takes a 1920s Speakeasy and combines it with a Parisian club scene, and throws in a humidor for good measure. Live jazz music, imported Absinthe liquors, now legal to sell in the US, and top shelf martinis make this place the perfect spot for a mixed crowd of socializers and smokers. 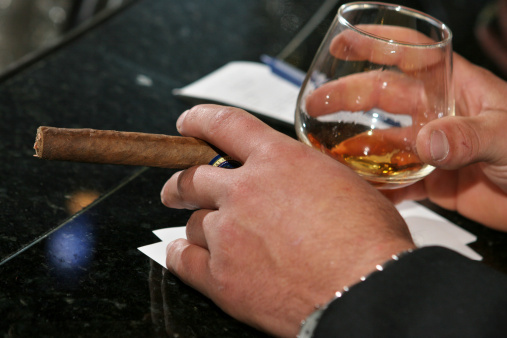 The Sabor Cigar and Wine Lounge on the north side of town packs an impressive, although regularly changing, inventory of some of the finest cigars, as well as a long list of wines and imported beers. If you’re feeling a bit hungry, there are the typical light fares available to enjoy with your choice of smoke.